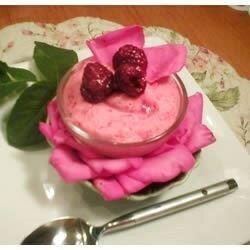 "This is a deliciously light dessert that works well for summer picnics or even between cake layers. My Peruvian mother-in-law was kind enough to give me this recipe, and I thought you might like it, as well." Bring water to a boil in a small saucepan. Stir in gelatin until completely dissolved, then place into refrigerator until cool (but not solid). Pour evaporated milk into a large bowl, and whip with a hand mixer until fluffy and doubled in volume. While continuing to beat, slowly pour in cooled gelatin. When all of the gelatin has been incorporated, pour the mixture into a mold or bowl and chill until set, about 3 hours. Once set, serve garnished with raspberries. My family liked it alot, nice and light. I will definitely make it again. I think that I will try different flavors next time. this is wonderful. I did not put the jello mix in the fridge, I just left it on the counter to cool to room temp. It definately serves more than 5 people. A very old recipe because my mother used to make it with different flavors of jello. Suggest you use only 3/4 can of evaporated milk. Always the first dessert to disappear at a church supper. My grandmother from"the old country" Scotland, used to make this for me 50 years ago! It is so good and so simple to make...brings back many good memories!! Super easy,ligth and soft,Looking to make it with diferent flavors.